Bulk-fill adapter. 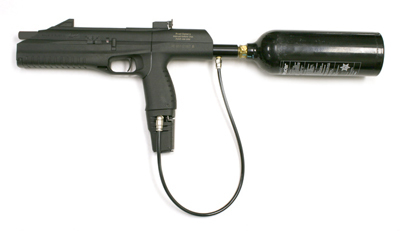 One end connects to paintball CO2 tank, other end takes the place of a 12-gram CO2 cartridge inside the grip of the gun. Closeup of the adapter that replaces the CO2 cartridge inside the grip of the gun. 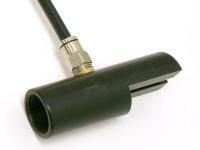 Connector that attaches to paintball CO2 tank. Your gun may be marked Drozd, IZH Drozd or MP Drozd and may have any one of these mfr names: IZH, IZH-Baikal or Baikal. They all come from the same plant and are manufactured to the same specs. The guns are identical. Includes Drozd BB pistol, 20-oz. bulk-fill CO2 tank and hose. The Drozd is made in Russia by IZH-Baikal. This one has been specially modified with a refillable 20-oz. CO2 tank that will shoot about 1,300 shots before you have to refill it!) 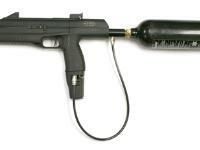 Spend less time (and money) on small CO2 cartridges and more time shooting. If you want to convert back to 12-gram CO2 cartridges, you can easily do that! 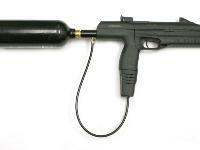 As shown in the picture, the CO2 gas flows from the tank into an adapter housed in the grip. That adapter is the same size and shape as a standard 12-gram CO2 cartridge. There are three switches to operate the unique select-fire mechanism. The first one turns on the gun. The second one selects the firing mode: semi-auto (one shot with each pull of the trigger), three-round burst (full-auto) or six-round burst (full-auto). The third switch controls the burst rate: 300 rounds per minute, 450 rounds per minute or 600 rounds per minute. 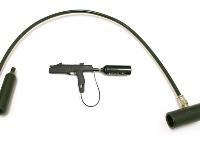 The gun comes with a detachable shoulder stock (increases length by 5.75" but cannot be used with 20-oz. tank), scope rail, sights, one 30-round magazine and a BB loader. 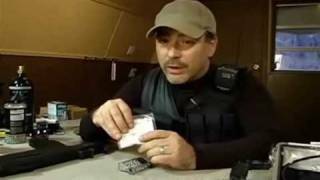 The magazine holds the ammo and the CO2 cartridge. This black Russian wonder is great as an all-day plinker. If you'd like to mount a pistol scope or red dot, that's easy enough with the 11mm dovetails. Click the AMMO link to stock up on ammo. Check the ACCESSORIES link for red dot sights, fun targets and safety gear you'll need. 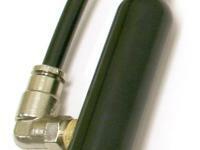 The tank screws into an adapter, from which the hose exits. That's where the connection is made. It is okay to leave CO2 in the tank during times when you are not using the gun. Things I liked: Fire rate is excellent. Get the bulk adapter, you won't regret it. What others should know: This gun can be loud with the 6 round burst. I live in a quiet neighborhood, the gun attracts a lot of attention. Other than that, this gun has fun written all over it. Things I liked: this gun is a lot of fun and well built if your looking for fun this is it. Refillable 12-oz. CO2 tank lets you shoot with less hassle! No more changing 12-gram CO2 cartridges! Greater accuracy & increased consistency.